I have been clipping coupons for a long time, but it wasn’t until I quit my job to stay at home full time that I became really serious about it. Between the reduction in our income and rising grocery prices I knew that I had to do something to cut expenses. Food and household item expenditures seemed like a good place to start. I have found the cost of my Sunday paper to be well worth the savings that I am able to get by combining my coupons with sales. What impresses me the most is that I haven’t so much changed what I am buying…I have just changed how I am buying it. For example, last week I bought big boxes of Kellogg’s cereal for $1! I was able to do this by using coupons, combining them with sales, and shopping around. In an effort to share some information about what I have learned about couponing this year, I am going to write a series of posts titled “All About Couponing“. I am hoping that this will help those of you who are newer to couponing, or those of you who are thinking about trying it out, but aren’t sure where to start. This week I am going to focus on the coupon inserts that come in the Sunday newspaper. If you get a Sunday newspaper, you know that each week you can find coupon insert booklets like the ones in the picture above. We usually see anywhere between 1 and 3 most weeks, with some weeks bringing 4 or more. In my experience thus far, January was the best month for coupon inserts (in quantity anyway). Occasionally Kellogg’s (and other companies) will release inserts as well. You can find the name of your coupon inserts on the front page of the insert. 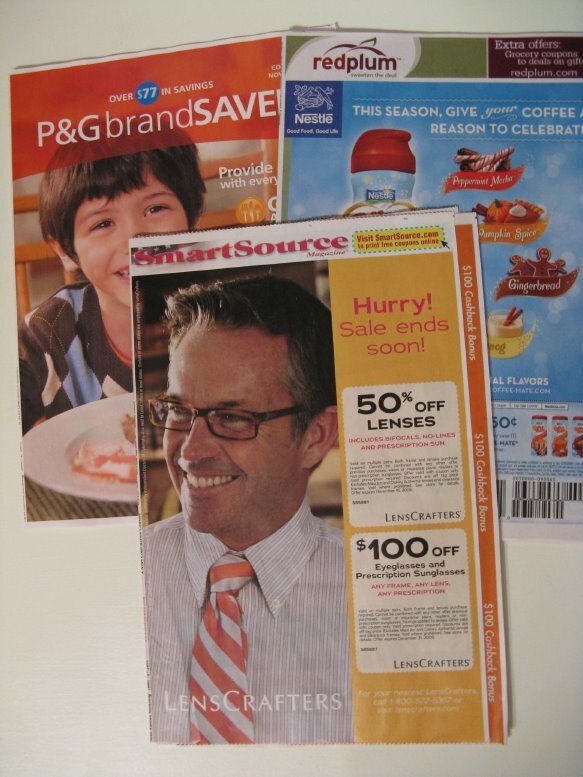 For example, the three inserts in the picture above are Proctor and Gamble (P&G), Red Plum, and Smart Source. No one method of coupon organizing works for everyone, but what I like to do is to clip only the coupons I am fairly certain I will use. I then file the rest of the (unclipped) coupon insert(s) in my coupon binder, just in case I decide to pull a coupon that I didn’t expect to use. When I write my deals posts, I always reference a date along with the insert name when listing paper coupons (see examples here). I was recently trying to come up with a method of labeling my inserts so that I knew which date they were released when I discovered something….the coupon insert has the date printed on the binding! Take a look if you haven’t already…it is there along with the newspaper name that the insert was placed in. Now I have an easy way to keep my inserts in order when filing them in my binder. Speaking of newspapers, it is important to note that not all coupon inserts are created equal. It seems that the larger the newspaper, the better the coupon inserts. While you can view a coupon insert preview online (here, for example), there is no way of knowing exactly which coupons will be in your paper until you have it in your hands. You always have the option of buying coupons online or subscribing to a larger newspaper if you would like to take advantage of the more robust coupon inserts. And of course there is a growing number of printable coupon resources available online which help supplement the coupons that come in the newspaper. And that brings me to the next topic in my “All About Couponing” series…you guessed it…printable coupons. Stay tuned! Do you have additional questions about coupon inserts that I didn’t answer here? Please feel free to post a comment. Do you have a tip about coupon inserts that I didn’t share? Please feel free to mention that as well! Previous post: My Kroger Mega Event Deals – $49 for $10!